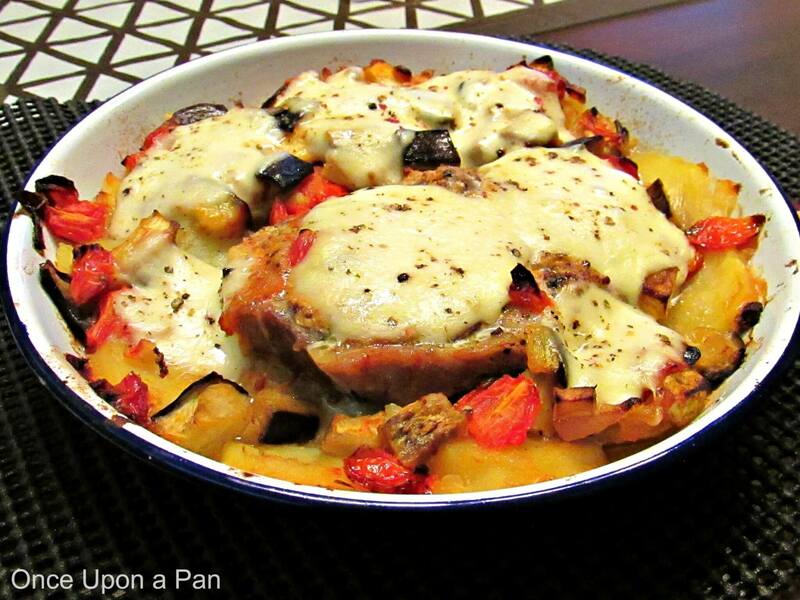 No idea where I got this roasted pork chops with aubergines, potatoes and mozzarella recipe but it’s one of those dishes that just worked really well 🙂 In the end it was just a way of using the ingredients I had in the fridge. Season the pork chops with salt and pepper and set aside. Peel the potatoes and boiling them for about 10 min. The potatoes should not be cooked completely. Let them cool, slice and set aside. In a frying pan, heat olive oil then fry the garlic, tomatoes and aubergine for about 10 min. In a baking tray or individual oven plates, cover the bottom with olive oil and the slices of potatoes. On top, place the pork chops. Drizzle everything with the tomato and aubergine sauce. Finish by topping all with the slices of mozzarella. Place it in the oven for 30 min till the meat is cooked and the cheese is melted.